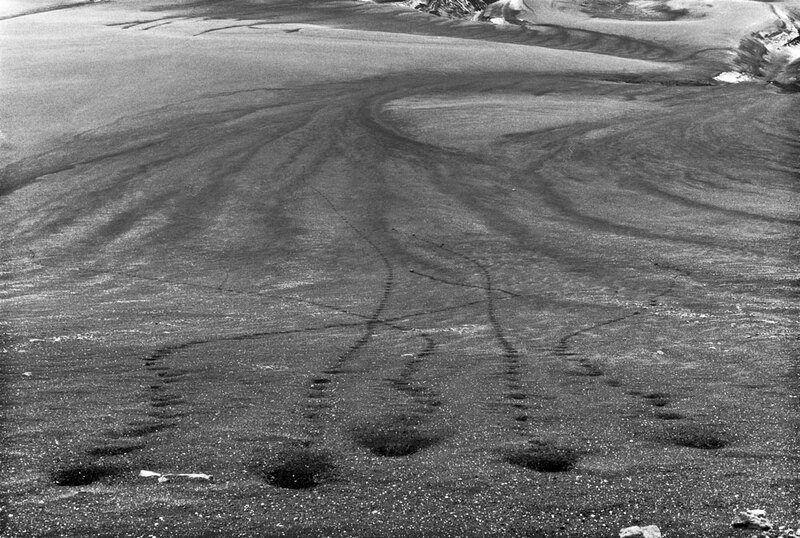 Long’s work could of course be seen as land art. He is, after all, manipulating the landscape; changing it – often very temporarily – through his actions. These are not Robert Smithson style earthworks though. Long’s interventions into the landscape are quieter, more short-lived. Though Long often works in ways that require endurance – staying in the landscape for long periods of time or walking long distances – his works seem to me to be fundamentally in tune with the environment; he works with the landscape rather than against it. 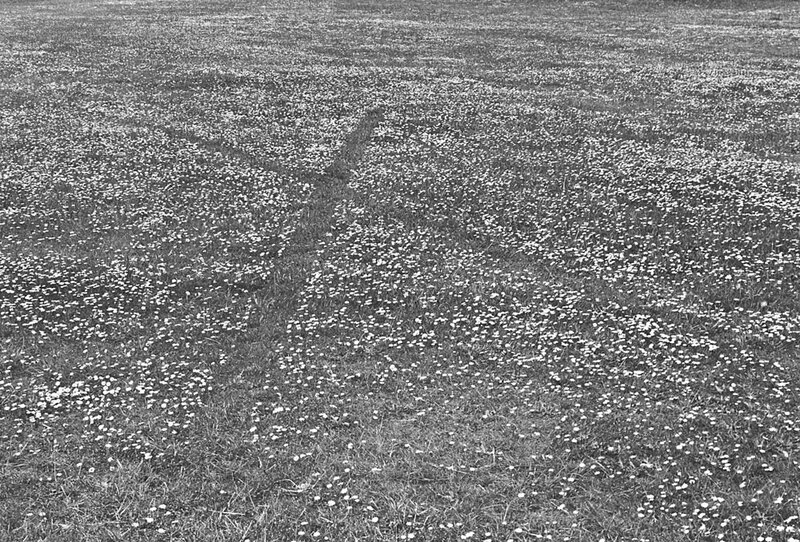 Whether scuffing his feet while walking in a straight line or trimming the daisies to make a cross on the grass, Long’s earliest interventions were slight and somehow very rooted in the English landscape he clearly loves. Five Stones, made in Iceland in 1974, could also be seen as a drawing of sorts. Here the lines are formed not by Long directly but by the boulders he’s rolled down the side of the volcano. The lines here are less ordered than those he made in A Line made by Walking and England. There is a randomness as the stones go with the flow as they journey down the mountainside; it looks in a way as though they were racing. In a way, perhaps, it’s appropriate that the interventions into the English landscape are ordered – polite, almost to the point of counting as gardening – whereas there is an uncontrolled wildness to the work made in the more rugged terrain of an Icelandic volcano. 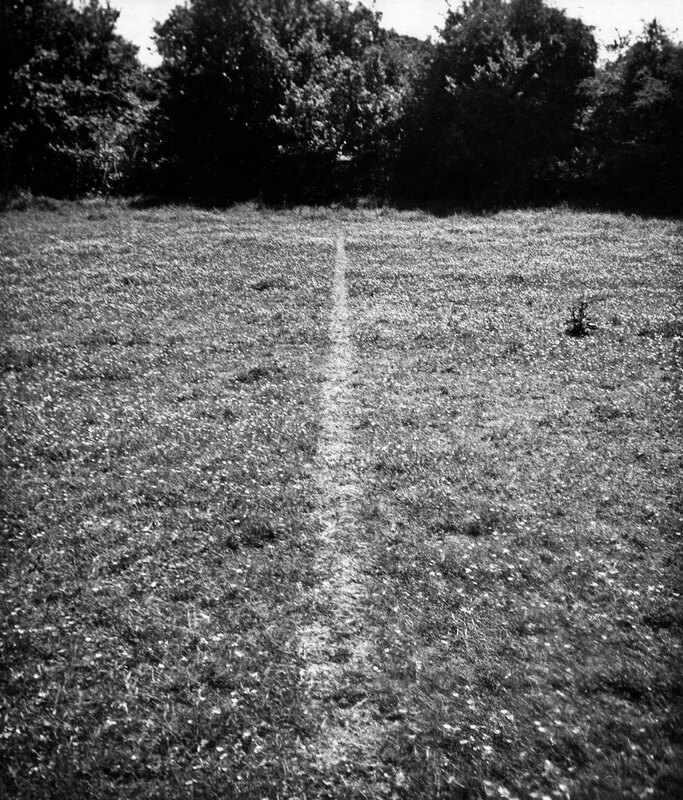 This entry was posted in Drawing, Intervention, Land Art, Photography and tagged A Line Made By Walking, art, England, Five Stones, intervention, land art, photography, Richard Long by Ann Jones. Bookmark the permalink.